Welcome to Earthly Delights Ltd - We are a registered company committed to helping you be a success at composting with worms. Bedrock Worms has supplied compost worms to New Zealanders for over 12 years. On this website you will find lots of useful information and products to help you use compost worms in your home and garden. NEW! Visit our D.I.Y. corner on the Info page!! Special Worm Packs for the Can-O-Worms, Biolytixs Septic tanks, Compost toilets, and DIY worm farms. A large selection of Worm Farms and other recycling products - including the Hungry Tiger range as seen in many preschools and schools throughout Christchurch. Soil Conditioners and Bulk Vermicast for improving soil, gardens, greenhouses, horticulture, viticulture and pasture. Do you want to recycle heaps of kitchen scraps and garden waste? 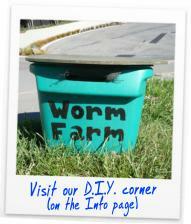 Do you want to start a Worm Farm that's easy and affordable? Do you want trailer loads of vermicast or vermicompost for your garden, orchard, hothouse, vineyard or pasture?